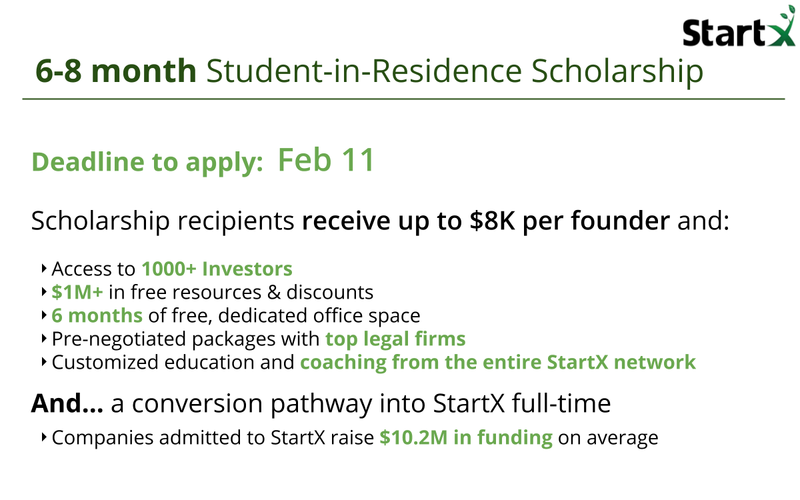 Students who receive the Student-in-Residence scholarship also earn exclusive access to structured ways of connecting with StartX's network of hundreds of highly experienced and industry-leading mentors to help you think through important decisions, including successful StartX entrepreneurs, VCs, Stanford faculty and alumni -- receive customized coaching, where and when you need it most, from top notch coaches and domain experts. We are an educational non-profit whose mission is to accelerate the development of the highest-potential founders out of Stanford through experiential education and collective intelligence. We require no fees and take no equity. Student entrepreneurs have to work on many things they haven't worked on before. The best student entrepreneurs know they need to be as equipped as possible, because that's what it takes to succeed. We know that getting mentorship, coaching and expert advice, will definitely make a difference; and our SIR recipients are privileged to by trained by some of the best Stanford affiliated (and non-Stanford) founders, mentors and advisors. Exclusively available to Student-in-Residence recipients, is structured programming to offer tactical help & resources, experiential education, funding and a vast network of mentors, investors, and domain experts. Recipients of the Student-in-Residence scholarship are carefully selected, and each cycle we welcome founders who are amazingly diverse, passionate, and talented. We are confident that the training and mentorship provided to Student-in-Residence scholarship recipients will be put to good use. A maximum of two founders are eligible for funding through the program. Each founder can receive up to $8000 during the summer session and $3000 during the school year. Through our community, you can get access to 1200+ world class coaches and advisors, on demand access to experts, and customized educational programming based your team + industry + stage. Plus, all companies receive $1.2 million+ of free resources, as well as drop-in office space, legal advice, etc. The scholarship and its accompanying mentorship is completely free; We don’t take any equity from you! No strings attached. Student-in-Residence judges focus on evaluating the team rather than the idea. How many companies do you admit? What is your acceptance rate? We don’t have a set quota / number of companies. Student-in-Residence judges will admit any team that exceeds our quality bar. Note: Historically, the acceptance rate varies between 8%-10%. How many application cycles do you run every year? How long is the mentorship program? Am I too early for the Student-in-Residence scholarship? Founders are evaluated purely on their potential. A great way to find out what you need to be admitted, is to have applied in a previous cycle. Teams not admitted are always offered customized advice & feedback, on what steps they can take to reach the next level. The application process itself is a great learning opportunity, it forces you to think about uncomfortable but crucial parts of your business, and on top of that every applicant gets valuable feedback from the judges. We are an educational non-profit and our goal is to help all entrepreneurs reach the level they need.